I have hesitated before blogging about this because I still can’t believe it. My direct paternal line has had one Samuel Braund at its head since 1977. Since then I have found out more about this 6 x great grandfather and his descendants but have singularly failed to identify his parents, his date of birth or where he was born. He first turns up in 1741, when he gets married in Cornwall where he works as a teacher. I know from my work on the Braund One Name Study that he is likely to have come from Devon and my book on his life, Cornish Origins, even gave some ‘best guesses’ regarding his connection to existing Braund family trees. FindMyPast have not been my best friends since the changes to their website that they laughingly refer to as ‘improvements’. Despite this, the addition of many more Devon parish register images to their site meant I could resume the hunt for Samuel. Braund of course has many variants. Most things that start ‘Br’ and have an ‘n’ somewhere near the end qualify. I identified a likely baptism to a Humphry and Florence Brand in 1716 at Sampford Courtenay. I then searched for other children of this couple in Sampford Courtenay and came up with Elizabeth, baptised 5 November 1718 and John baptised 4 December 1720; in both these cases the parents were given as John and Florence Brand. Now I was under the impression that Florence only became popular as a christian name following the rise to fame of Florence Nightingale and indeed, searching the whole of Devon for seventeenth and eighteenth century Florences, of any surname, revealed very few. Had she been Mary or Elizabeth, I would have been sceptical but this looked like the same family to me; was Humphrey a clerical error? I now sought to prove three things:- That these three Sampford Courtenay baptisms were the same family. That the Brands were Braunds in disguise. That this was the long sought baptism of my 6 times great grandfather, Samuel Braund. The obvious thing to do was to look for a marriage between Florence and a Humphry and/or John Brand, Broad, Braund, or similar variation. Initially nothing was found. I did find a burial for a Florence Brawn on 30 June 1757 at St. Eustachius, Tavistock. Tavistock is the ‘big town’, some twenty miles south west of Sampford Courtenay but given the very unusual christian name, Florence, this looked like our lady and moved the Brand surname closer to Braund. I failed to find a burial for a Humphry or John but it looked as if Florence’s daughter, Elizabeth was also in Tavistock. I tried again for a marriage, this time searching for any marriages of ladies called Florence, to anyone, anywhere in Devon between 1680 and 1720. Working my way through the few options located Florencia Maritati and Johannes Braund marrying in Northlew on 1 May 1715. Northlew is ten miles from Sampford Courtenay and was not only home to a Braund family but a parish that I had identified as a possible origin for Samuel. A look at the image of the original marriage register was very exciting, the entry read ‘Johannes Braund de Sampford Courtenay et Florencia maritati sunt primo die Maii’. I was disappointed to relinquish the exotic ‘Maritati’ name; this was merely Latin for ‘married’ and no surname was recorded for Florence. I was however now convinced that the three Sampford Courtenay Brand baptisms were a single family and also I was happy that they were indeed Braunds in disguise. It was looking more and more likely that I had the right Samuel but could I find any more substantiating evidence to prove it? I tried searching for Devon baptisms between 1710 and 1750 where the mother’s name was Florence, again ignoring the surname. Sure enough, up came two children who were indexed as the offspring of John and Florence Browne but on checking the originals, were in fact Brawnes. They were both baptised at Sourton, between Sampford Courtenay and Tavistock and were Humphrey, baptised on 15 January 1723/4 and Rebecca on 2 January 1725/6. There was a Rebecca Braund buried in the same parish as my Samuel who I had identified as a possible sister or sister in law. Rebecca’s age at burial made this baptism just three months too early but I felt as though I was getting closer. The inclusion of a Humphry amongst the children was interesting, perhaps this name had some significance and might account for the confusion over the father’s name in Samuel’s baptism entry. The next move seemed to be to look for futures for the children of John and Florence, to see whether they fitted, or were incompatible with, my Cornish Braunds. Amongst others, I found a niece for the Sampford Courtenay Samuel called Rebecca, baptised in May 1761. My Cornish Samuel’s will mentions his niece Rebecca Hunt née Braund. 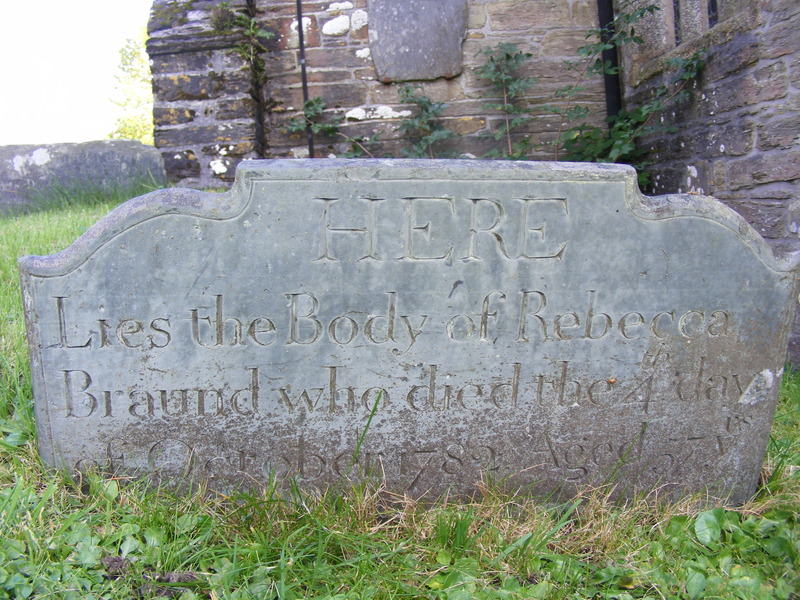 Rebecca Hunt’s burial suggests a birth between August 1759 and August 1760, again close and of course she may not have been baptised as a tiny baby. The identification of these two Rebeccas, related to the Samuel who was baptised in Sampford Courtenay, both of whom were very close to the ages of those connected to my Samuel Braund, meant that it looked as though John and Florence were indeed my 7 x great grandparents. Somehow though I just can’t bring myself to ‘ink them in’. I am not sure what I am waiting for in terms of additional proof but I seem to feel I need something more. Is it just that I cannot believe that I have made progress on this line after so long? Then of course, if I do accept John and Flo and I think I do, there is the matter of proving who John was, in the absence of surviving Northlew parish registers for this time. Some of you have kindly enquired about the home improvements. We are still tackling a final leak in the conservatory but it really is nearly finished. The trouble is with testing the efficacy of leak mending is that you need it to rain! A slight diversion last week however as I came down in the morning to find water pouring and I do mean pouring, through the kitchen ceiling. Yes that would be the kitchen ceiling that had just been painted. Stopcock turned off and the water slows to a trickle. Emergency plumber, bless him, arrives within the hour. He decides it is a problem between the water tank and the bathroom. He needs access to the pipe. Sadly also between the water tank and the bathroom are two bedrooms, containing between them twelve full height, crammed bookcases, to say nothing of other things and the carpets have to come up. Spring cleaning these rooms hadn’t been on the ‘to do’ list but most of the contents are moved to gain access to the recalcitrant pipe. This incident coincides with the saga of the parcel. I am tracking its whereabouts on the internet. To be fair the first time they tried to deliver it I wasn’t in. It is rescheduled for the following day. As I am moving the contents of the two bedrooms I have things to do so staying in isn’t a hardship. I am at home, the front door is open, the back door is open. Strange then that the tracking tells me that they have tried to deliver the parcel at 3.15 and I wasn’t in. I ring the firm and explain that I was indeed in. I acknowledge that my house isn’t easy to find and provide a phone number so the driver can ring for assistance when he arrives in the village. 5.40 and the tracking says they have tried to deliver it again and I wasn’t in! I ring again, more assertively now. There is no note of my phone number on the paperwork. I give the phone number again and instructions on ‘how to find my house’ (park outside the Methodist Church) and also ‘how not to find my house’ (do not pay any attention to the Sat Nav). The receptionist is not impressed that my address contains no road name; this is clearly somehow my fault. The next day dawns, this is not a day when I had planned to stay at home but I do. Finally I get a call from the delivery man. He, like others of his ilk, is incapable of identifying a Methodist church when he sees one (clue – it says ‘Methodist Church’ outside) and is parked up the road outside the Anglican church. I walk up to relieve him of the parcel and explain where he should have been. It turns out that he has been trying to deliver to the house over the road. He seems to have identified a property, with no apparent name or number, in roughly the right area and has gone for it. Obviously asking at the heavily signposted, nearby shop was not a possibility. Never mind he says I know where it is now. In the next sentence he tells me he only has another week in the job. So I am fine for future deliveries from this firm for the next week only. I didn’t ask if his new job required initiative of any kind. Hastily, I should explain that he two parts of the title are not connected! Saturday I got up at the crack of dawn and dawn cracks pretty early in June in the UK, to set off for London. As I heaved a case of books on and off trains I started to realise that a week of moving books and furniture (there will be a forthcoming post about this activity) had taken a toll on my back. Notwithstanding, I arrived at The Society of Genealogists to take part in their Seventeenth Century day seminar. Unfortunately even my ‘first train of the day’ start was not early enough to get me there in time to hear Elsa Churchill but I caught most of Colin Chapman’s informative session, packed with sources for C17th research. Colin and I often turn up on the same bill and it is always a pleasure to listen to him. After the lunch break and some running repairs to the air conditioning, which appeared to allow the room to be cold or hot but nothing in between, it was my turn. I chatted about the impact of witchcraft on the lives of our C17th ancestors and lightened my load by re-homing some of my books, in return for a perfectly reasonable sum of money. Strangely, after becoming interested in this topic as part of my general foray into the social history of the C17th, I discovered that one of those tried for witchcraft, Joanna Elford, was probably related to me. I was followed by Michael Gandy and was very thankful that it wasn’t the other way round. Michael’s subject was how to read C17th handwriting and I suspect the audience were expecting sight of letter shapes and perhaps collective interpretation of documents. This was not to be. It takes an exceptional speaker to engage an end of the day audience for an hour and a half with not a single visual aid. Unbelievably, Michael held the room in thrall with an entertaining, relevant, tour de force on this topic without actually showing us any C17th writing at all – brilliant. Then it was off to catch up with my school fellows who made up the class of 1974. I had missed the reunion itself but fifteen tail-enders were to spend the night in a nearby hotel and I set off to join them. School reunions can be fraught with anxieties: ‘What shall I wear?’ in my case compounded by the lack of room in the case full of books and the need to make it suitable for the talk as well. ‘Will I recognise anyone?’ ‘Will anyone recognise me?’ and if they do, does this mean I have worn well or that I still look as gawky as I did at school? ‘Have I been sufficiently successful?’ And most importantly, ‘How do my wrinkles/greying hair/middle aged spead compare?’. Of course anyone who voluntarily reconnects with a group of people they haven’t seen for forty years is going to be someone who is comfortable in their own skin, someone who feels they have ‘arrived’, by their own standards if not by anyone else’s. I limp my way as far as East Croydon station and decide that I really can’t face trying to find out where they have hidden the 64 bus stop since I was last here. I therefore elected to spend a high proportion of my book sales money on a taxi to the hotel. Said hotel is ‘posh’ by my standards. Ok, I know most of my hotel going is of the Premier Inn variety but this is four star. Although the surroundings are lovely it turns out that really only the prices are four star. Admittedly our party was accompanied by two sets of wedding guests and a group of England football supporters, who may well have been renegades from one of the wedding receptions but the service was execrable. I was expecting the food to be of the variety where you need a magnifying glass to see anything beyond the drizzle but there were several mouthfuls on each plate. Unfortunately, I somehow managed to choose something that contained two of my least favourite foods but that was my own fault. My room is situated in the furthest reaches of the building, on the top floor and along an extremely long corridor. I struggle along with my case, which although no longer quite so full of books, was still heavier than my increasingly ‘twinging’ back was comfortable with. I come to terms with the room’s idiosyncrasies. The shower has no visible means of being switched on. I try turning, pushing and pressing various parts of the mechanism and am on the point of giving up when something I do results in water gushing out. Sadly, it took whoever was in the neighbouring room until 2.00am to work out how theirs worked and then they had a noisy and lengthy shower. Then there was the bed. To begin with I had twin beds that had been pushed together. I kept losing things down the narrow gap between the beds. Having retrieved the Kindle for the third time, whilst listening to midnight wedding revellers, I was beginning to despair. The bed was also as hard as ….. I will refrain from making any of the possible obscene similes here and just say it wasn’t very hard, not ideal when one has a bad back. Of course none of this really mattered because we were there to meet our former school fellows and the chatting and reminiscing was in full force. We all have slightly different perceptions of the rarefied atmosphere that was our alma mater but agreed that we had an excellent grounding for our varied futures. Whether school days were the best or worst days of our lives, if we are historians, we should be recording our memories. Of course it is much easier to recall those memories in the company of those who shared them. If an actual reunion isn’t possible, what about a virtual one? Facebook, Google+, or just plain emails, are all possible vehicles for this. I and my classmates may not being doing this again in another forty years but a good time was had by all. Then there was the journey home. Now, as I have said on previous occasions, I am no longer fit to be let out on my own. One of my former school fellows had offered to shepherd me back to the station. Where I come from two busses a day is considered a regular service but of course I am now almost in the metropolis so there are plenty of options, despite it being a Sunday. We are going for the tram. Ah, there are no trams. The police have cordoned off the area round our destination due to an illegal rave. I know I and my former classmates were on the rowdy side but to call us an illegal rave seems harsh. A bus driver is planning to go as close as the police will allow to the station and we hop on board. In my case the ‘hopping’ was more of a hauling but we are on our way. Although the road is closed, the station is open and I start the journey home through the engineering works and tube line closures. I manage to get an earlier than planned train out of London but sadly not early enough to get a different train from Exeter onwards. Two hours on a wooden bench at Exeter station puts paid to any remaining mobility in my back. Eventually home safe and sound. Now to edit the ‘year book’ that we are compiling; interesting to see the different paths that we have all taken. Regular readers will know that I am being ably assisted by a group of lovely ladies who are writing about their experiences of the period 1946-1969. This month’s topic is schooling and as I can’t expect them to do something that I wouldn’t do myself, I have been waxing lyrical about ‘the best days of my life’. This has been made easier by membership of Facebook groups for my cohorts at both primary and secondary school. One of my lasting primary school memories was of being chosen to read part of the commentary for a film that we were making about our school and its surroundings. My portion was about the local lollipop man and the resulting 35mm film was being sent to a school in New Zealand. Wouldn’t it be great, I thought, to trace the film fifty one years later. None of my contemporaries recalled this at all and I began to think I had imagined it. In any case New Zealand has many school and I had no idea which one. Then, as part of my writing, I raided the souvenirs’ box. Something that I had retained was a letter to parents from the headmaster, written three years after the film was made. Amongst other things, it referred to Mr Head who had taught at my school for a year in 1961 before returning to New Zealand. Now I at least had a teacher’s name. It also mentioned that Mr Head was then in the Pacific Island of Niue. Googling ‘Mr Head teacher New Zealand’ and the like is not awfully successful as up come all the head teachers in the world, or at least in New Zealand. Niue however is a different matter and it turned out that Mr Head was not only a teacher but an active campaigner against landmines and had been awarded for his work. Wikipedia even provided me with a list of schools at which he’d served, of which there were a great many. Unfortunately no dates were mentioned and I needed to know where he was in 1963. None of the schools’ websites had a ‘past staff’ section or indeed any kind of ‘history of the school’ page. I was close but not close enough. By this time I had identified some of Mr Head’s descendants on Facebook but I was unable to send them a message as they weren’t my friends. Next I sent out a plea to family historian friends in New Zealand. Amongst other information, one was able to use the New Zealand equivalent of ‘Friends Reunited’ and find that a profile had been created for the late Mr Head. This time I was able to identify the appropriate school. It just shows where the right contacts and a little detective work can get you. I would like to be able to say that a copy of the film is now on its way to me but things aren’t that good. I have used the school’s website to send a message asking if they have a reel of 35mm film lurking in the back of a cupboard. No response so far but maybe it will depend on whether on not the person who sees the message is history minded. Watch this space. And on the subject of school I am now off to a school reunion. I am going via a talk about seventeenth century witchcraft (best not to enquire) at The Society of Genealogist. More of this later.